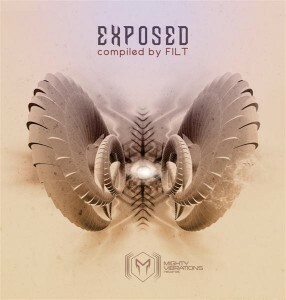 Mighty Vibrations Records proudly presents Exposed, compiled by label co-owner Filt and now ready to be unleashed upon mankind! This compilation provides a solid selection of dark and deep progressive psytrance tracks ranging all the way from 128 up to 142 BPM with contributions from all over the planet. Mastering by Anti-Logic Studio @ Berlin with artwork by Zero Point Productions. MP3 Download | FLAC Download | WAV Download · Download count: 7,616. Thanks to all involved ! Thats the style I am heading for. Last track is a banger!!! :))) Cool album too! The Powder Monkey track is essentially a remix of Heisenburg (http://www.ektoplazm.com/free-music/step-into-the-cave). It’s good – I’m keeping them both – but the congruity between the tracks is noteworthy. personally I was put off by the sci fi horror sampling in the Powder Monkey track, and thought it rendered the song a skipper. Samples of people screaming or of cheesy dialogue from movies and games is very unpsychedelic IMO. I’ve been a huge fan of industrial my whole life but don’t dig this vibe. It reminds me of a console FPS. The rest of the album is full of groovy, well mastered basslines and big expansive soundscapes. beautiful, one of many solid Ektoplazm psygressive comps… I particularly love Vorg “Kimmours”. Bouncy! Diffus has quickly risen to the top of the heap, in my book! Seriously inventive, mischievious stuff. Its an album compiled by Filt, of course its gonna be good!! !